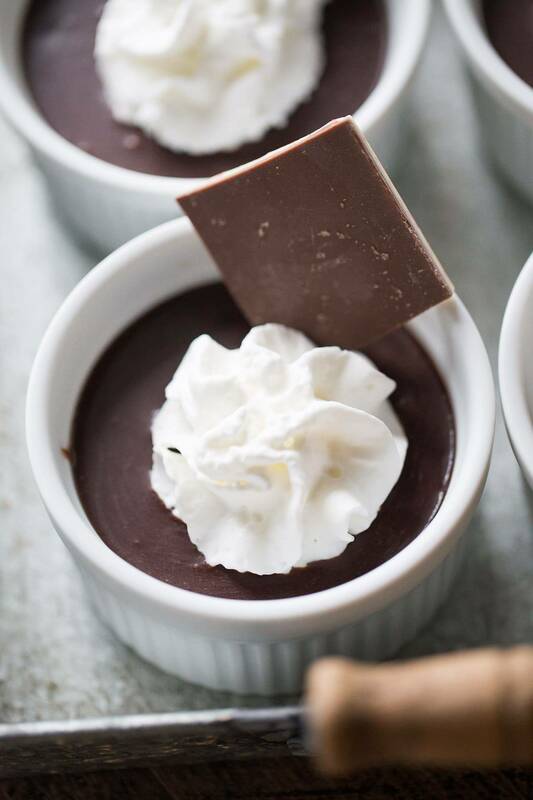 Creamy peppermint flavored white chocolate topped with a chocolate peppermint ganache make these simple pots de creme absolutely festive! There are a million reasons why I love this time of year. I love how excited my kids get as they wait for Santa; I love the shopping, the festivities, the decorating, time with family and the traditions. But I also love that the holidays give me the BEST excuse to challenge myself to make new and different recipes. Last year I tried my hands at making my own Mallow Cups with this Peppermint Marshmallow Cream Cup recipe, and I’m so glad I did! These little marshmallow cups were the hit of the holidays. The year before, it was this Chocolate Cherry Pavlova which turned out way better than I expected. What I’ve learned from some of these “challenging” recipes is that a recipe may appear to be difficult then turn out to be insanely easy. And we ALL need easy this time of year don’t we? I have always wanted try my hand at making pots de creme, but for some reason, I have always been intimidated. Perhaps this intimidation comes from the name; it’s French and sounds so fancy. Since the holidays are the perfect time to be fancy, I thought I’d go for it! If you are looking for a show-stopping dessert this Christmas, then this is it! 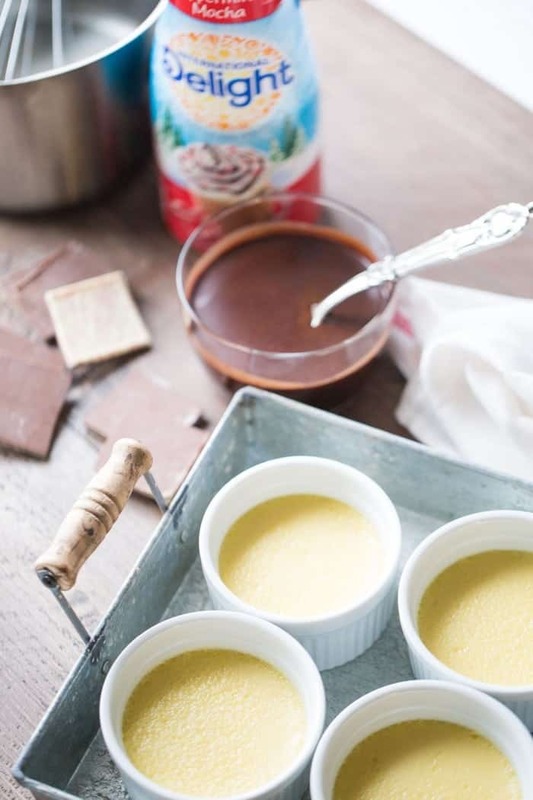 These pots de creme come together easily and rather quickly. The baking and the cool down are the most time-consuming elements of this recipe. This dessert tastes exquisite with all that creamy custard, ganache, and mint flavor. The contrast between the dark chocolate and the white chocolate in each bite of this custard makes this dessert look so elegant and impressive! A rich and creamy white chocolate and peppermint custard topped with a chocolate peppermint ganache. Spray 6 (8 oz) ramekins with baking spray and set aside. To prepare the custard, heat heavy cream, coffee creamer in a saucepan over medium heat just until the mixture comes to a low boil. Remove from heat and stir in chopped chocolate. Place mixture back on heat and return to a low boil, whisking the whole time. The mixture should thicken as it heats. Meanwhile, whisk egg yolks in a separate bowl, add sugar. Whisk until yolks are thick. When chocolate has thickened, slowly pour your chocolate mixture into your egg mixture, whisking as your pour. Pour custard through a fine-mesh strainer to remove any solids. Place ramekins in a baking dish. Add enough hot water to the baking dish so that the water covers half of the ramekins. Cover custards in foil and place custards in an oven that has been preheated to 300 degrees. Bake for 50 minutes. Remove and refrigerate custard for two hours. To prepare the ganache, bring creamer to a low boil of low heat. Place chocolate in a bowl and when the cream is bubbling around the edges then pour over the chocolate and whisk until smooth. Refrigerate for 10 minutes. 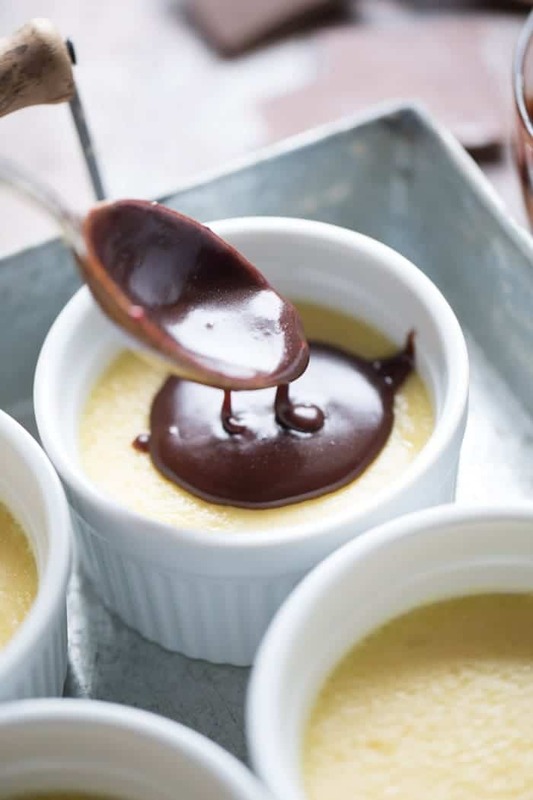 Spoon ganache over custard and refrigerate until ready to serve. You can never have enough delight! Sign up here to receive coupons, giveaways, and recipes from International Delight! 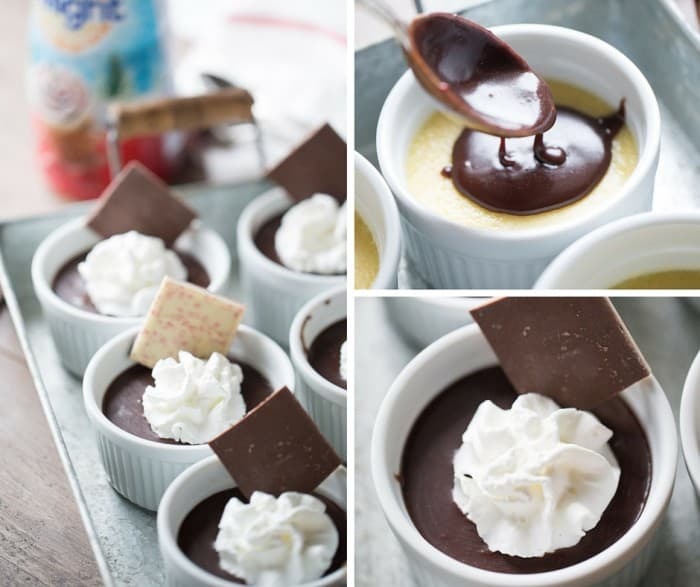 These little pots de creme should be renamed to pots of happiness! I love how chocolatey they look…I want them for breakfast ! I love pots de creme. So simple yet decadent. If this was the only dessert I ate in December, I’d be fine with that! Lovely! Tanya, these are sooo delicious looking!! I am all about chocolate & peppermint this season and plus I have this creamer in my fridge!! Hi Tanya! Wanted to thank you for the multitude of candies I just printed and pinned! Had a plan of what to make this year, then, SNAG! 4 OF yours, will be taking the place of something?! Been following blogs since just last March, have used many of your recipes, and always turn out lovely.Fairly new to Pinterest, am wondering, is it most helpful if I “pin”the largest pic? Or should I choose the one that causes more droolage?To get the highest enticement rate for future pinnings? I’ve never been asked which to pin! My favorite photos are usually the first in the post as well as any collage photos. As for the recipe, I cannot thank you enough for trying my recipes and for following along. That means so much to me! Please let me know if there is anything more you’d like to see on the blog! Thank you, Teri! Perfection! And I love how versatile coffee creamer is, so great! WOW! These look fantastic. I’d inhale them all, I bet! What an AWESOME use of coffee creamer! This is such a great way ti incorporate the creamer!! I have always wanted to try my hand at these too but for some reason, stayed away. I think I thought they were too difficult but after seeing this plus it has two types of chocolate, I am determined I need to make them! 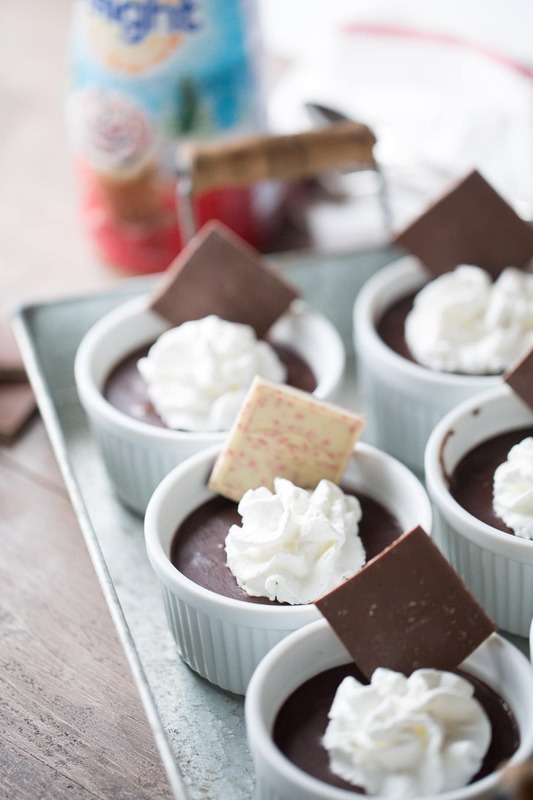 These are so adorable and would be perfect for a holiday dessert. I’m going to have to try this!! This is such a lovely dessert! Thanks for sharing! Wow these look AMAZING! I love that you used International Delight in them! Yum. I love all things mint. This is on my to do list now. Thanks for linking up with the Share the Wealth Link Party. I’m sharing this on my Facebook page this week. Merry Christmas! This sounds absolutely divine. Thanks for sharing on the Creative K Kids Tasty Tuesdays Linky Party. We will be back on Dec. 29th and hope you will join us. Incredible!!! Stunning gorgeous and all the adjectives. 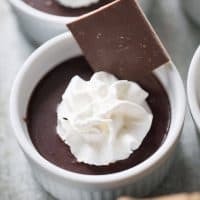 Oh, these sound delightful (pardon the pun 😉 ) and I’ve never made pots de creme, so think I’ll have to start with these.